What will they look like? That is the question addressed in this wonderfully illustrated book for "earthlings" who want to explore beyond the cardboard aliens of television science fiction to find out what science says about our cosmic cousins from other planet--if they exist. Author Terence Dickinson, an acclaimed astronomy writer, examines t! he picture we have absorbed from TV and movies about creatures from other planets, from the friendly visitor in E.T. to the savage creature in Alien and the gaggle of other-worldly folk from Star Trek and its clones. Dickinson then explains how the variety of environments in the universe could give rise to creature far more different from us than anything Hollywood's invented. Through the talents of illustrator Adolf Schaller, one of the chief artists and Emmy-award winner from Carl Sagan's Cosmos television series, alien worlds come alive with plants, insects and animals never dreamed of before. Yet, Schaller's vision is based on sound assumptions about the gravity of each hypothetical planet, the type of star that it orbits and other factors that bring plausible alien environments to life. The book winds up with a look at "life as we don't know it," featuring creatures and entities that might have evolved from something other that carbon-based biology, the foundation of ! Earth life. 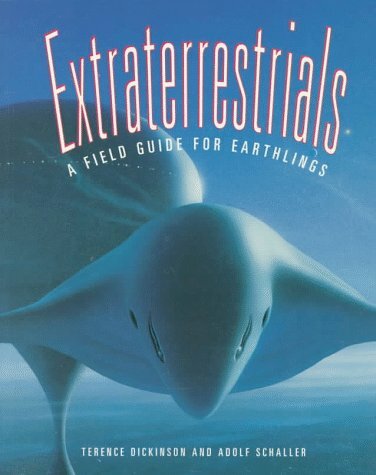 A unique blend of science and imagination, Extraterrestrials will compel anyone who has ever thought about what-and who-might be out there. If you have any questions about this product by Brand: Camden House, contact us by completing and submitting the form below. If you are looking for a specif part number, please include it with your message.